June 27, 2010 | By Patrick | Filed in: Geek, PAS. Of the many podcasts to which I subscribe a few are photography-related. They cover all sorts of random topics, and once in a while one catches my ear. One specific episode dealt with trying to capture lightning bolts. How can this be done? In the words of Doc Brown, you never know when or where lightning will strike. While I don’t have a great camera, I have a DSLR where I can control most of the settings to some degree. The podcast recommended setting up your camera during a storm, putting it on a tripod, and letting the shutter stay open for a long time. Typically, a shutter on a camera stays open for only a fraction of a second. Conversely, you can crank up the shutter time to leave it open for a full second…or 5 seconds, or 30 seconds or more. During one of the most recent storms, the situation seemed ideal. No rain but a fair amount of lightning. I decided to start with a 30-second shutter speed and got everything set up. After framing the camera to shoot through the lattice in the patio window, there was no need for me to look through the viewfinder – a perfect opportunity for the remote shutter button. Click (shutter opens)…wait 30 seconds (no lightning)…shutter closes. Click open…wait (nothing)…close. I have a new appreciation for how long 30 seconds is. 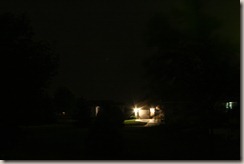 Of course most of lightning had passed, so I have a lot of pictures that look like the one to the left. Very dark except for one neighborly outdoor light. However, early on in the shoot I was lucky enough to capture the shot to the right. 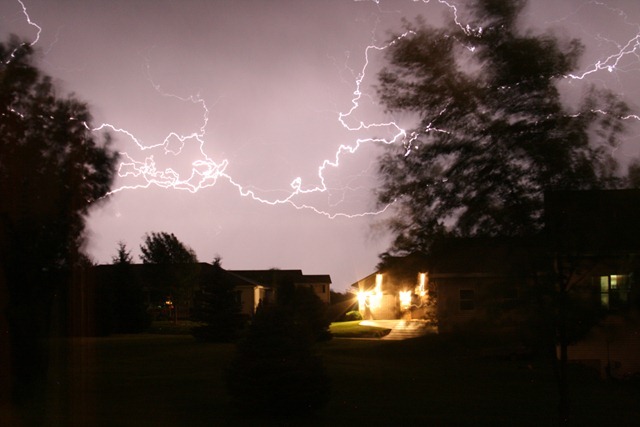 I think it was actually multiple lightning strikes during the 30-second exposure, but I think it looks pretty cool. With this kind of luck, I should end up with dozens of lightning pictures, right? Wrong. I have 130+ pictures of darkness and one picture with lightning. I have one other photo where the lightning strike was out of the frame, but that’s it. Ideal conditions: stormy, no rain, background with no moving objects and no other light. Set up early in a very dark room (even the bright scenes in the movie we were watching threw enough light to get in the picture), pick a shutter speed that works for you (10-30 seconds), and use a remote shutter release and a tripod. Ideally, shoot through an open window to reduce glare. I will do this again. Once the gear is set up, the photography part is as simple as can be. Sit on the couch and just keep firing. In case you’re interested, the two photography podcasts that are in my iPod are Christ Marquardt’s Tips From the Top Floor and Scott Bourne’s PhotoFocus.